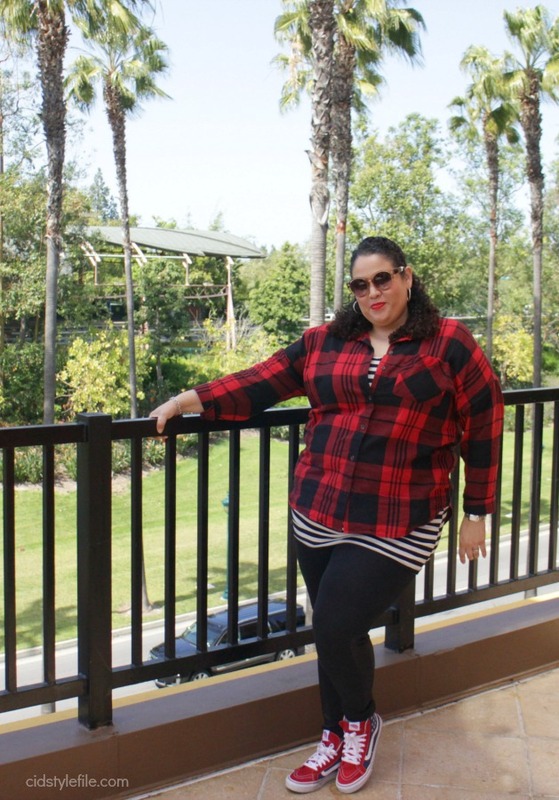 Cid Style File: What Do You Wear to Brunch in Downtown Disney? As much I love to "do brunch", sadly I don't do it too often. When I was invited to attend the Gigasavvy Social Club for brunch, I said "heck yes." Especially when its close to home at a restaurant in Downtown Disney. Tortilla Jo's is introducing a new brunch menu for the weekends. The only issue was what to wear to brunch. When I attend the taping of a talk show the attire required was "Sunday Brunch" what does that even mean. I was confused and couldn't decide if that meant dressed up or causal attire. Well logically to me "brunch attire" means to wear stretchy pants, and be comfortable, but still look cute. Seems to be my style motto, comfy and cute. Having been to Downtown Disney many times, I knew there would plenty of walking involved, as well as plenty of eating. I had to go with the comfy, stretchy and walk-able shoes. I decide to go with this outfit, which actually is inspired by a new collection from City Chic. Sadly the look is only available on their Australian website, so being crafty and resourceful, I shopped my closet to recreate it. 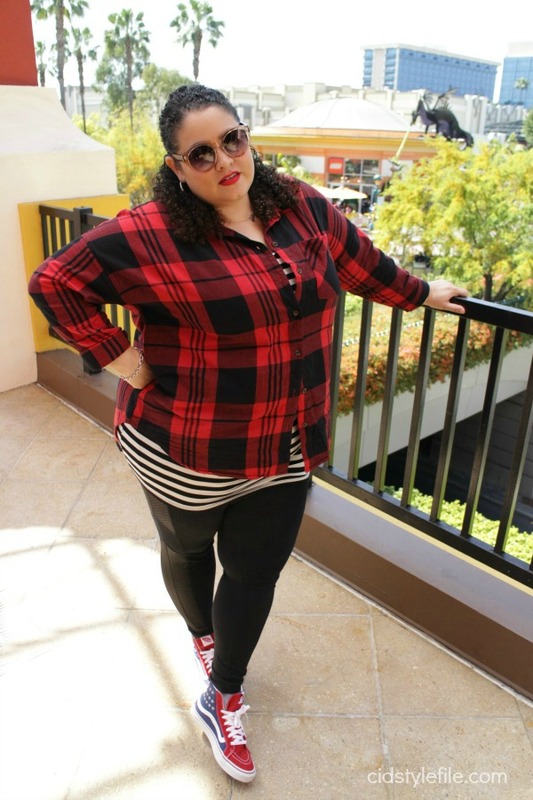 Well I didn't recreate the look just used it as inspiration, mixing prints black and white stripes with red plaid shirt. Lately I've done plenty closet shopping, its helped me be more creative with my outfits. It has also helped me save money and wear more of my clothes that have been neglected. Now that we have the outfit details taken care of lets talk food! Tortilla Jo's is one of the many sit down restaurants available at Downtown Disney. This was my first time eating at Tortilla Jo's, but excited after hearing the rumor or bottomless mimosas! They recently introduced a new brunch menu for Saturday & Sunday only. The menu has various Mexican and Latin inspired dishes as well as your fave brunch staples. We were able to sample a few of the items from the brunch menu. All items include an entree, fresh fruit and dessert for $14. Not a bad deal and if you enjoy a mimosa with your brunch, you can add the bottomless mimosa option for only $10. One the dishes we tasted was Huevos Rancheros, a classic Mexican dish. It's an egg sunny side up on top a fried tortilla with refried beans, covered in spicy tomato sauce and topped with cotija cheese and served with a side of potatoes. Reminded me of the breakfast we had growing up, my mom made Huevos Rancheros on special occasions. They are one of my favorite breakfast foods and so delish. Another dish served for brunch is the Chile Relleno with Machaca con Huevo. I've never eaten a chile relleno with meat, this was a tasty treat for me. The entree comes with beans and rice, and oh so yummy. I have to admit eating 2 chiles rellenos, they were very good. 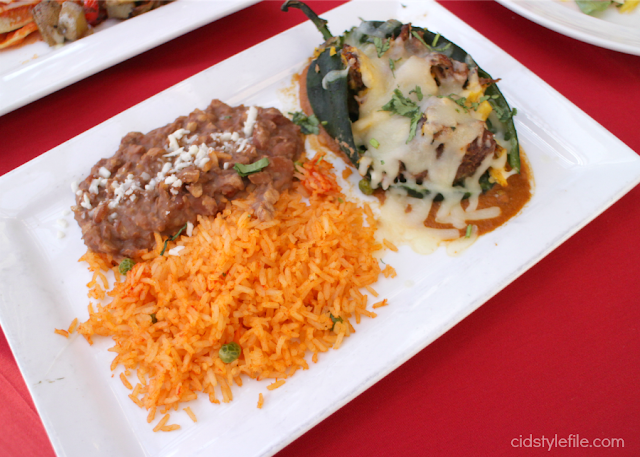 The shredded beef and egg mixed was a good combo for the spicy chile relleno topped with cheese. You know any thing topped with melted cheese is gonna be GOOD. 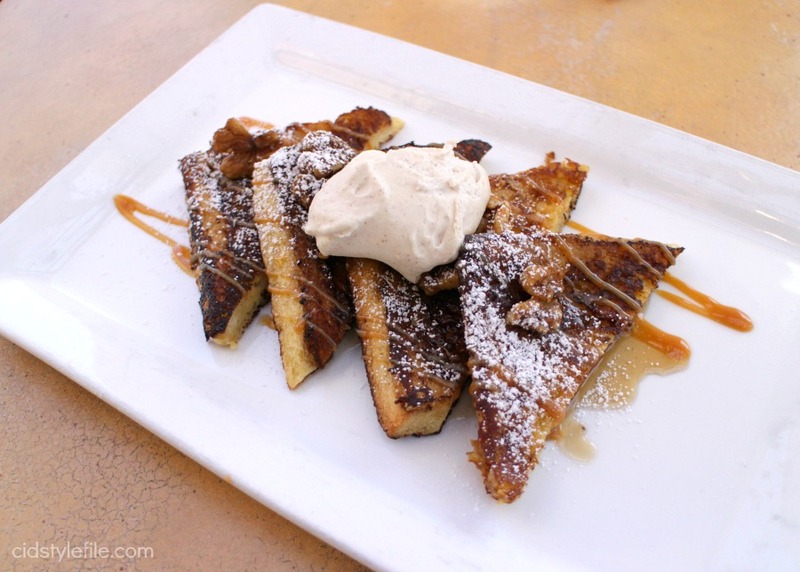 Tortilla Jo's also offers some traditional brunch options like these Cinnamom French Toast, with a Latin twist. You get these fluffy Brioche French Toast with candied walnuts, cajeta syrup and wait for it.....horchata whip cream. YESSS! These were also a favorite of mine, the combo of the fluffy bread, crunchy nuts and sweet whip cream was heavenly! It was a great brunch, and if you get a seat on their upstairs patio you will have a lovely view of Downtown Disney. After the brunch we took a stroll to window shop and enjoy the beautiful day. 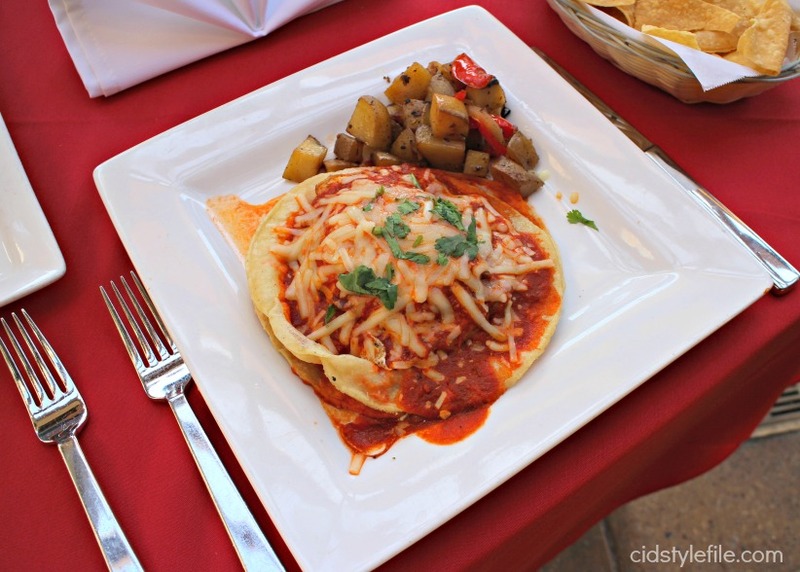 I would have never considered going to Downtown Disney for brunch, but now that I know about Tortilla Jo's I will be visiting more often, with validated parking you can enjoy 4 hours of brunch and strolling. Or even catch a movie after brunch at the AMC theater. It's also a good option for dining if you are visiting Disneyland and want to avoid the long lines and crowds of the park eateries. For the price you pay to eat inside Disneyland you may get a better meal here which you can enjoy from all the hustle and bustle of the park. If you want more details on Tortilla Jo's and the brunch menu you can visit the website here. Thanks Gigasavvy Social Club for this experience, looking forward to more tasty events. Make sure to follow me on Instagram and Snapchat for all the behind the scenes shenanigans. Leave me comment and tell me wheres your favorite brunch spot? Oh My God, I almost bought those Vans over the weekend! They are so awesome!! I love the stripes & plaid combo!! And those huevos rancheros looked SOO good!! Thanks, it was inspired by a new City Chic collection. DAng that food looks good. But I cannot pul off plaid. It worked for me in my 20's but I just don't look right in it anymore. BUt you look adorable! OMG the food looks amazing! I also love the outfit; comfy and chic. I love the outfit and the food is making me drool!!! Looks like you had a blast too!! Thanks for linking up to Top of the World Style. 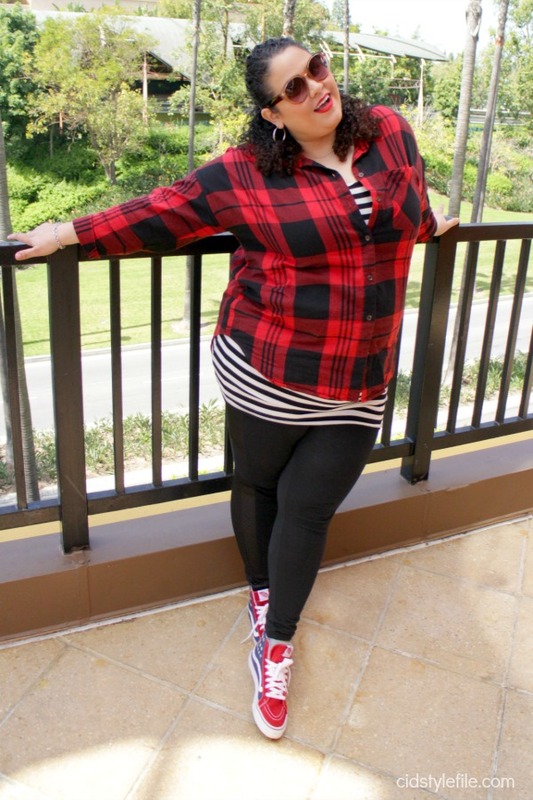 Love the plaid with stripes and the shoes are icing on the cake!